Yes, "There's an App for That". But it's sure missing something you need (unless you're Tim Cook). Compose your own. Without any code. • Design flexible data types representing information you need to keep track of (e.g., People, Activities, Lists, Customers, Inventory). • Organize and catalog your dataverse into a tree-like structure of containers. 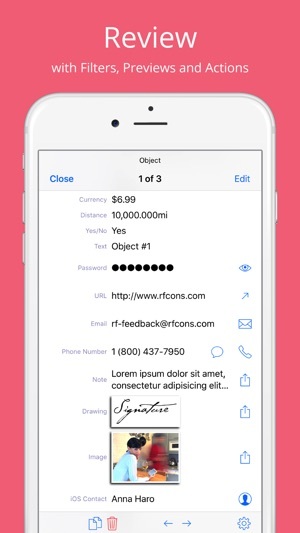 • Collect data with touch-optimized forms and take advantage of never-enter-data-twice (NED2) methodology. • Review information with quick filters, in-depth searches, multi-sorting and at-a-glance previews. 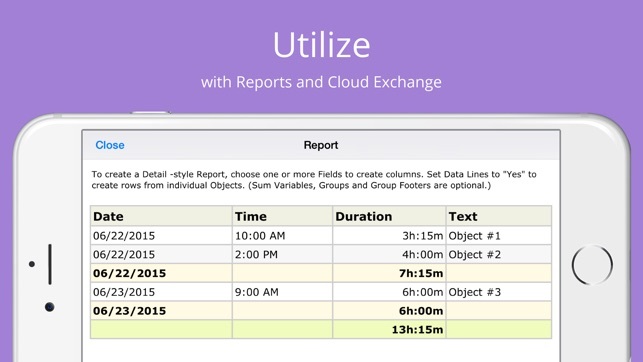 • Utilize your knowledge base with custom reports and cloud document exchange. Keep track of anything. Especially time and money. Most importantly, Objectality replaces traditional, technical information design concepts such as "foreign keys" and "related forms" with object-oriented notions such as "Composition" and "References" that are incomparably more intuitive to non-technical power-users. Not only create a custom Product (e.g., with a Label and a Photo), not only construct a specialized Order (e.g., with a Date and a Signature), but also have each new Order specify a known Product, effortlessly. Anyone can assemble focused, personalized applications that rival one-size-fits-all software products. Make sure your app is not missing anything you need. Be a citizen developer, have it your way. The product has been selected as an Honorable Mention (3rd-place) Winner in the "Productivity" category for an App Challenge by The Linux Foundation and Intel at the Mobile World Congress 2014. Major Objectality product features are completely free. The maximum storage capacity is 25 Objects. Get started now and have Objectality expand later with your needs. 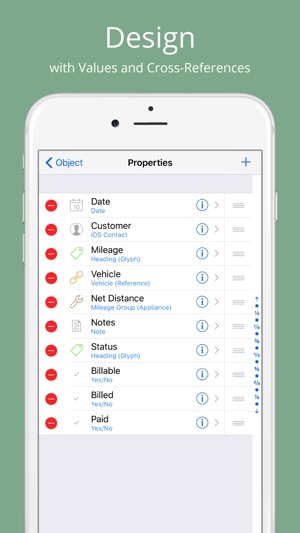 Unlimited storage capacity and additional business-centric features such as reporting, cloud document exchange or time, expense and mileage tracking are available for purchase in a Biz Feature Pack. Try before you buy for as long as 45 days. The Objectality project is an invitation to collaborative design. Please let us know of any suggestions for improvement you might have or any problems you run into. • New Types: Location (GPS), Barcode (scan). • Search capability across multiple Folders and Files. 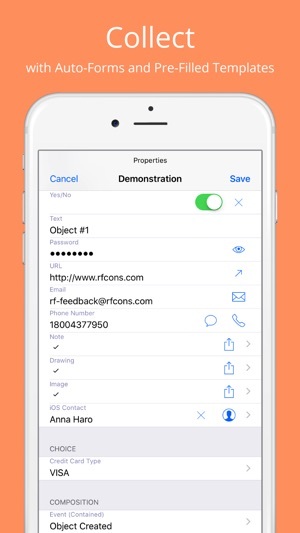 • Tap in the "Object" View to Quick-Look text and images. • Inching forward toward A Perfect Application (bug fixes). I wonder how much this costs? Apparently I only have a license until 5/31. The purchase button isn't loading, so I have no idea how much I'll have to pay in a month to keep this. There's no in-app purchase in the App Store, and the purchase link from the web site takes me to the app page in the App Store. The app seems like a very powerful DB with viewing, data entry, and reporting capabilities, but the learning curve is steep, especially since they don't use industry-standard terms. Therefore, I won't delve into learning this until June 1st. 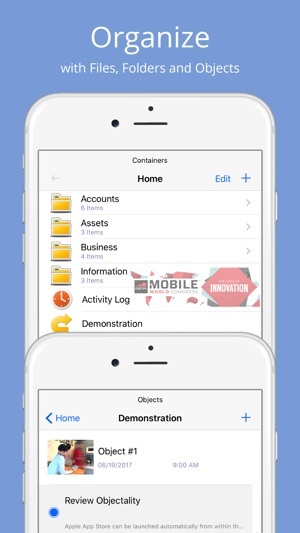 App terminology has been greatly simplified in the latest versions of Objectality, both when it comes to data organization (through more intuitive "Files" and "Folders"), as well as data design (through more straightforward "Objects" and their "Properties"). In-App Purchases should (long) be working flawlessly. Appreciate the feedback! So far this has been a good, functional database for me. Don't really know what its limits are. I bought the biz pack, and am using it as a custom asset tracking dbase. It is reasonably easy to customize, although the help is in tech speak and not an easy read. I would like an improved way to pull reports, hopefully in future updates. I am delighted I found this app. I want to use it for storing information that organizes the way I want it to. I look forward to making some of my own templates as we as using the ones that come with the app. I will update my review once I have more experience with it. © 2011 R&F Consulting, Inc.